According to Sandata CEO Tom Underwood, there are four models that states might use to implement Electronic Visit Verification, which every state must do by January, 2019 to comply with the 21st Century CURES Act. Three of them lead to failure. We sat down with Underwood after his standing-room-only presentation for the Home Care Association of Florida last month. 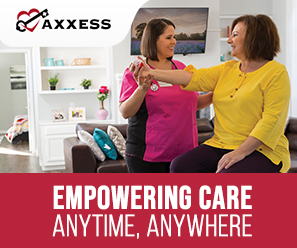 The CEO defined EVV as "a modular technology solution that provides transparency into home-based care delivery, supporting provider network optimization while improving the member's quality of care." Typical EVV systems include a scheduling module and a visit verification module, usually using a mobile phone or the patient's phone, though a fixed EVV device is another option. In December 2016, President Obama signed into law a bill mandating EVV implementation in home care but giving each state leeway in how to comply. Underwood identified four models that have emerged so far among the 18 states that mandated EVV before the CURES law required it. Provider Choice Model: (used by three states) In provider choice, the state does not become involved in each provider's vendor selection. MCO Choice Model: (used by three states)In this model, the state allows each Managed Care Organization to decide which vendor it will accept. State Choice Model: (used by 10 states)The state Medicaid authority selects one or two approved vendors. Open Vendor Model: (used by one state with another in planning stages)This is a hybrid solution. The state selects a single vendor while allowing providers and MCOs to continue using their existing EVV systems. In Washington, Missouri and New York, the state requires the provider community to self-fund, select and implement an EVV solution of their choosing, generally by a required deadline. Some states have offered a preferred vendor list from which providers select one, while other states have simply established a minimum set of standards for vendor product features. Along with standards, some states also require a minimum set of reporting on EVV activity. Low cost to the state. Unless the state decides to measure or monitor the program (e.g. compliance with minimum standards, review of reporting, etc.) there is low overhead cost to manage the program. No data integration is required. All costs accrue to providers, including those that may not have the technical expertise to successfully select and deploy a solution or financially stable enough to pay for one. Some providers have demanded additional state funds to help them comply with the mandate. The state does not have access to visit data to support quality monitoring unless they implement audits and hire staff to spot check providers. Without monitoring, EVV utilization (compliance) is lower. With monitoring, varying features and functions across multiple vendors makes assessing care quality difficult for states. Where enforcement and monitoring are not in place, published studies show neither cost savings nor reduction in fraud, waste and abuse. In New Mexico, Iowa and Tennessee, MCOs that manage Medicaid beneficiaries select and implement an EVV solution from the vendor of their choosing. States may set minimum standards for vendor product features and require a minimum set of reporting on EVV activity. Low cost to the state. No expense of RFP processing, vendor evaluation, selection and procurement. No data integration between state and EVV systems required unless state desires to measure or monitor for compliance. Costs incurred by MCOs will be passed to the state when they demand higher reimbursement rates. In states where there is more than one MCO, if each MCO selects a different vendor, program complexity may make data and reporting inconsistencies inevitable. Providers with contracts to multiple MCOs, each with a different EVV vendor, incur significant inefficiencies and cost burdens. May be forced to teach staff to use multiple EVV systems, requiring much more time for training and more time per visit, potentially reducing compliance. Caregivers must know which MCO each patient uses, and know if and when a patient changes policies. Back office staff must maintain multiple systems for scheduling, billing and payroll processing. Providers achieve no efficiency benefits from EVV system compliance. In Alabama, Connecticut, Illinois, Kansas, Mississippi, Oklahoma, Oregon, Rhode Island, Texas and South Carolina, the state Medicaid program contracts with a single -- or sometimes two or three -- EVV vendors and mandates that all provider agencies must use that vendor's system. The selected vendor's solution is implemented at the state level, often in six months or less. State maintains direct management and oversight over the entire program. Typically, the state pays 10% of provider implementation costs and matches 90% of services costs, including purchasing and implementation, program management and provider monitoring. This model qualifies for an enhanced match of 75% for ongoing program operational costs. Providers given an EVV system at no cost which may enhance back office process efficiencies, eliminate some paper-based processes and support better management of remote workforce. If the state uses MCOs, the mandated EVV system can be integrated with MCO systems to improve their efficiencies. MCOs can use the state-mandated system to standardize management of client home care organizations. EVV compliance may be enhanced. Easy access to quality reports at all levels of the state system as well as data for state auditing and investigations. When the vendor's scheduling component is implemented, alerts can be triggered directly to state or MCO care managers, potentially reducing gaps in care and improving care coordination. This model requires the greatest investment of state resources for vendor selection and ongoing vendor management. Providers that have already standardized their business processes around an EVV system -- from their EMR vendor or a 3rd party supplier -- must decide whether to attempt to use both (which never works) or to manage, train, and support a new system that is disparate from their core business systems. State-mandates cover only minimum requirements for visit verification and some reporting. EMR-vendor and 3rd party EVV systems include a menu of more sophisticated features, including task checklists, reporting, scheduling, emergency missed visit coverage, etc. Switching to the state-mandated system necessarily requires abandoning all of those additional features. Conclusion: Mixed. Least costly for the state and smallest home care providers. Bad news for providers with existing EVV systems in place. In Ohio and Florida, beginning next year and this fall, respectively, a new, hybrid model is being tried. It allows the state to select a vendor to provide EVV solutions while allowing all providers and MCOs that already have a system in place to keep their existing system. Providers without EVV already implemented can select the system that best suits its needs. In this model, States establish the technology requirements and configuration, rules and policies regarding the program, and purchase an EVV system on behalf of and at no cost to their Providers who do not currently have an EVV system of their own. States that offer this elect to “open the model” to third party EVV systems. In this Open EVV Model, once a visit is completed, a vendor agnostic Aggregator system takes in data from all EVV systems and applies standardized business rules to ensure the visits are properly verified and ultimately paid, generates alerts as needed and provides comprehensive oversight over the entire program – regardless of EVV system used. All EVV systems in use must meet specific minimum technology standards. Some system costs may be shared with providers and MCOs that maintain their own systems. Impact to provider and MCO systems is minimal, especially when all MCOs use the state-sponsored system. State achieves higher level of EVV compliance. State can measure utilization through policy; can add incentives and/or penalties. High level of care coordination is achieved through data aggregation, resulting in improved health outcomes for beneficiaries. Aggregated data allow alerts to be triggered to state or MCO managers for late/missed visits, additional beneficiary needs, etc. Higher savings and return on investment (expected) as compared to the unfunded mandate. A level of complexity is added when providers and MCOs are permitted to retain their current systems. State must be fully engaged with establishing requirements, procurement, vendor selection and program management. Conclusion: Highly recommended, provided measures are put in place to keep all state MCO partners on the same EVV system. Underwood's strong feelings about the pitfalls of the first three models should be heeded by state Medicaid officials who are currently researching their options. No EVV CEO has had interaction with as many state Medicaid offices, no EVV vendor has tried as many different models and learned, sometimes the hard way, what works and what does not. He concludes his presentations, and emphasized to us, the same admonition. "Each state must carefully evaluate its unique environment in order to select the EVV model that is right for its own program while complying with the new mandate. Factors to consider include concerns impacting fraud, waste and abuse, impacts to the provider network, overall service quality, and how states are using Managed Care companies to deliver services."